Bees can combine electric charges and visual signals to find which flowers they like. Researchers at the University of Bristol have found that bees can sense a flower's electric field, which allows them to better choose between flowers they like and flowers they don't like. The researchers found that electrical signalling was a "rapid and dynamic" way for plants and pollinators to communicate. While flying, the bees gather a positive charge, and flowers are negatively charged. The difference in electrostatic forces allows the bee to return to flowers it liked, while cuing the pollen on the flower to jump to the bee. 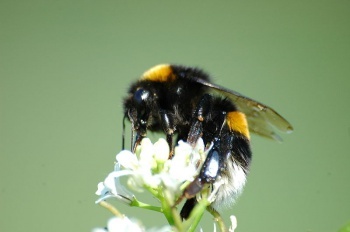 Professor Daniel Robert, one of the study's authors, told the BBC that "This is a new way to we can look at the interactions between bees and flowers. This doesn't throw away any of the previous work on cues that flowers are using, it adds another layer on top of that." No previous study has investigated the role that electrostatic forces might play in the pollination process. "We looked at [existing] literature and realised that the bees were being positively charged when they fly around, and that flowers have a negative potential," said Robert. "There's always this electrical bias around. As a sensory biologist, suddenly I thought: can the bees sense that?" During the study, Bumblebees were allowed 50 visits to fake flowers the authors designed. Flowers in the arena with a positive charge were filled with sweet liquid, while negatively charged flowers were filled with bitter liquid. Over the course of their visits, bees developed a preference for the sweet liquid flowers with positive charges. During the last ten visits, the electric fields were turned off, and the bees went back to selecting flowers at random. "We know they can detect these electrostatic fields," said Robert. "This is the tip of the iceberg, there's so much more that we haven't seen yet." The study was published in the online journal Science Express.